Tweaks leveled lists for immersion purposes. Crimsomrider is the creator of "Clothing of The Commonwealth". He has given me permission to upload this .esp file. Crimsomrider - author/creator of "Clothing of The Commonwealth"
Seeing similar pieces of clothing (I.E: Western Undies, Western Corset, etc.) too often in wastelanders/settlers. Too many use slave clothing. Makes that the prisoners may use Slave Clothing from Clothing Of The Commonwealth instead of only using Tattered Rags. 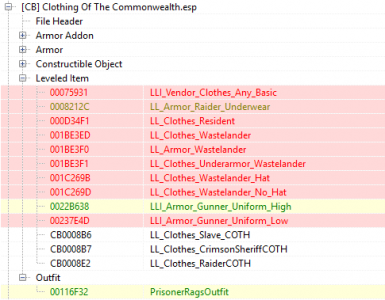 Install with NMM, press "yes" when prompted to overwrite Clothing Of The Commonwealth's esp file. If installing manually, drop in the Data folder and overwrite. A merged patch or a bashed patch is required if you have multiple mods that edit leveled lists. You can do it either on FO4Edit or in Wrye Bash. program, and then enable it in NMM. patch in the window that pops up, and hit accept.